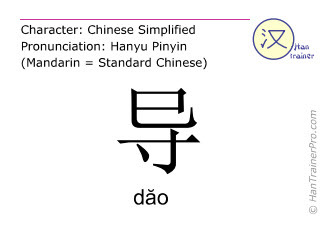 You cannot listen to the pronunciation of dao because your browser does not support the audio element. 汉字 汉字(现代汉字即简体字)，点击下方的小字看汉字的笔划顺序动画来学习怎样正确的书写汉字"我们怎样正确书写 导 ( dăo ) ?" 导 is composed of 6 strokes and therefore is of low complexity compared to the other simplified Chinese characters (average: 13.1 strokes).